Integrity Recycling and Waste Solutions efficiently markets its customers’ recyclables on six continents, processing more than 25,000 tons of recyclables per month (300,000 tons per year). In addition to our local presence, we form strategic partnerships with global end-users that enable us to offer customers quality service and competitive pricing across North America. 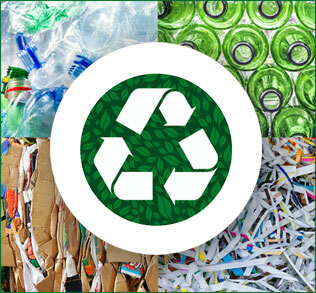 We have the financial stability, depth of experience, global market contacts, and adaptable support services to generate consistently high returns for our customers’ recyclable materials even as market conditions fluctuate. Education – Many companies unknowingly discard a potential revenue source with their recyclables. They leave the final disposition up to a vendor. Integrity Recycling and Waste Solutions, on the other hand, makes it a practice to teach customers the true value of what they’re throwing away. We believe in educating and informing our customers every step of the way; that’s part of the advantage of working with Integrity Recycling. Monthly Reports – Each month you receive a report that details your recyclable tonnage, value, and environmental impact. In addition, you can expect to receive regular updates on the recycling commodities markets, changes in legislation, and current commodity values from independent industry publications. Continuous Monitoring – At the same time, we continue to monitor industry developments and advise you of technological advances and new markets that might reduce your environmental impact, minimize your costs, and maximize your profits. We aim to forge lasting relationships with our customer, not only through excellent service, but also through ongoing education and operational transparency. As your trusted partner, we want you to know what we’re doing and why. At Integrity Recycling and Waste Solutions, we do everything because of the customer. Please contact us today to learn more about the Integrity Advantage! Call us today to find out what makes Integrity the best choice for recycling and waste management solutions!